Your building is damaged from the impact and you sit with a hefty repair bill – money you could have avoided wasting if you had installed a bumper. The vehicle sustains damage from the impact. Someone is injured and you’re liable for their injuries. Don’t risk you or your visitors bumping into any obstacles when driving or parking. Using dock bumpers will help in safe manoeuvring, driving and delivery. Bollard Shop provides high-quality docking bumpers that will prevent unnecessary accidents. Contact us today to place your order. These provide perfect protection for any type of low loading truck docks, and make great wall protection from forklifts and other material-handling vehicles. Because it’s made from prime rubber containing nylon and polyester, it will not warp, rust, rot or harden. These provide protection against vehicle damage to docks, buildings and cargo. They can absorb over 80% of the impact and shock, and are some of the most common bumpers used. Eliminates wear from the friction movement of trailers loading and unloading. 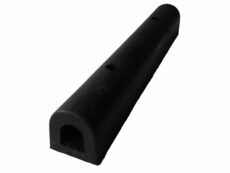 These bumpers are impervious to weather damage and can be used in any material handling system area where heavy-duty protection is needed. We provide a complete maintenance service for clients across the Perth Metropolitan area. Maintenance is integral to keeping your dock bumpers in peak condition. Our professional technicians perform routine or once-off inspections and repairs ensuring maximum effectiveness and longevity of your products. We also install safety products throughout the Perth Metropolitan area. To view our docking bumper range, contact us today.